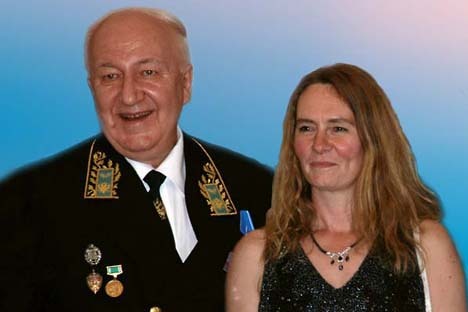 Alena Adamkova, the Executive Director of the International Roerich Memorial Trust, has been decorated with the Russian order of Friendship for her contribution into the development of the Russian-Indian cultural ties. Adamkova, curator and head of the International Roerich Memorial Trust (IRMT) and Gallery, located at Naggar, Kullu Valley, has been awarded the Order of Friendship, the highest Russian decoration for foreign citizens, by Russian President Dmitry Medvedev, the Russian embassy said here Thursday. Adamkova is honoured for her 'outstanding contribution towards furthering and strengthening Russian-Indian cultural and scientific ties,' says the citation. A specialist in Indian Studies, she lived for many years in Russia and India. In 2001, the Russian embassy in India appointed her as the head of the International Roerich Memorial Trust. In a message, Russian ambassador Alexander Kadakin stressed that Moscow highly valued Adamkova's long-standing activities for the noble cause of safeguarding and memorialising in India and elsewhere the priceless intellectual and artistic heritage of the unique Russian family of the Roerichs. The Roerichs made India their second home and served as a spiritual and cultural bridge between the peoples of Russia and India. The IRMT, located in Kullu Valley in Himachal Pradesh functions under the patronage of the co-chairmen of the Russian-Indian Inter-Governmental Commission on Trade, Economic, Scientific, Technological and Cultural Cooperation (IGC). The memorial complex of the Roerichs in the township of Naggar in the serene Kullu Valley comprises the estate where the illustrious Russian family of the elder Roerichs lived from 1929 to 1947, an Art Gallery and the 'Urusvati' Himalayan Research Institute. Until his death in 1993, it was the abode of Svetoslav Roerich and his legendary film star wife, Devika Rani. The estate is justly considered one of the unique treasure-houses of world culture.